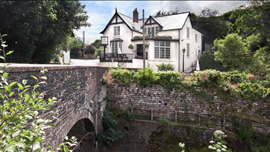 Right in the centre of the lovely old market town of Usk, the Three Salmons Hotel is a charming, family run coaching inn that can trace its history back to the seventeenth century. Following a serious refurbishment, the interior now marries history and atmosphere with up-to-date facilities and smart fittings. The re-vamped restaurant is all clean, crisp, elegant lines, and the food has been raised a notch or two in the process. The kitchen is proud of the fact that it now produces its own 'hand-crafted' bread and procures daily supplies of fresh fish from Brixham - check the daily specials. Confit salmon with cauliflower purée and sweet lemon dressing is an appetising starter, ahead of guinea fowl breasts on crayfish risotto with saffron cream or breast of Madgetts Farm duck with black pudding plum tomatoes and balsamic jus. Simpler grub is also available in the bar.